Cherry City Kitties : Ahoy Maties! So we STILL don't have photoshoppy (arrrr daddy, ya cheap bast***) so we couldn't dress up today, but rest assured earrings are being worn and the jolly roger is flying at the top of the cat castle in our living room. In leiu of that, we are demanding the cheapos buy us our own schooner ! Ahoy maties, tuna school off the port bow, prepare to plunder! Have a great day! What a great ship - just the tight size for you all. Enjoy your tuna when you've caught im. Oops it should say just the right size not just the tight size - LOL!! avast doods, yur ship for plunderin goods is rockin, if ya catch sum halibutt tho, make sure ya toss de scurvee fish bak ta sea !! Your sure have a rockin ship to use on your plunderin trips ! If ye aren't be having ye olde Photoshoppe, we, too be wishing ye a schooner for sailing the high seas! Aye, that be a fine ship ye be sailin'!! Arrrrr!! there be a way t'get both--tell yer cheap ba***** (well, that's what YOU called him!) t'go to: http://www.gimp.org an' download The Gimp fur free. mommer hath made all our pictures wif it fur years. he can do mighty near efurrythin' wif it that pricey ol' Photoshop does, save only not moovey-like stuff, just annymations. an' then there'll be plenty o'th'green papers left t'get ye yer own schooner--it looks t'be a mighty fine vessel! OMC, you need to get your people to get you a pirate ship. Our aunt gave us one of those, and it was great. Until we broke it on the high seas. Avast! Meowers from Missouri is right. You can use Gimp if you don't have Photoshop. For the kind of photo editing you need to do, it will work for free. Some PCs now ship with Adobe Elements bundled on them, and people don't realize that it's actually a "Photoshop lite." Happy pirates day! We dont have photoshop either, we do a lot in basic Paint and a free program called Gimp. 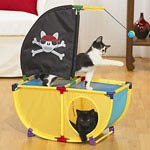 I love that little pirate ship, saw it when I was looking for pirate stuff for the kitties! 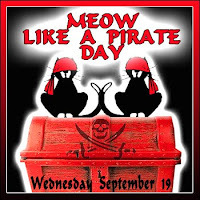 Happy Meow Like a Pirate Day, maties! I have one of those, even though I don't talk pirate! They are cool. Arrrrrrrrrrr!!! We be sharin' ar plunder with ar friends! Ye still be fine pirate kitties!! avast, ye mateys! we be in a similar boat. arrrr! we hope ye will still be findin treasure and plunder! Ahoy mateys! No quarter and no apologies! Ye do what ye can do. that photo is still cute! Your hearty skooner looks like a mighty fine vessel to sail in even without pirate gear especially with the fierce whapping ball. Oh how fun, I wanna play with you!! What a swell schooner! Looks like you all had lots of fun!